Questions linger after a 4-year-old girl from the United Kingdom was hit and killed by a car on the sand along Daytona Beach. It is widely recognized that beach driving can cause serious ecological impacts by potentially destroying nesting areas for sea turtles and birds such as the piping plover and damaging or destroying vegetation and dunes. Shore erosion can be accelerated by careless beach driving and vehicles on the beach can be a safety hazard to beach goers. In recognition of the potential impacts of beach driving, most areas that allow this practice regulate it in some way, including:requiring licenses or passes, limiting the number of vehicles on the beach, limiting beach, driving to certain types of vehicles (e.g. 4WD), enforcing speed limits, specifying beach access ramps and the, allowed driving zone along the beach, prohibiting driving on dunes an in other ecologically sensitive areas, prohibiting driving during certain times of the year, such as during seabird or sea turtle nesting seasons or when beach pedestrian traffic is so high that vehicles on the beach would represent a safety hazard. 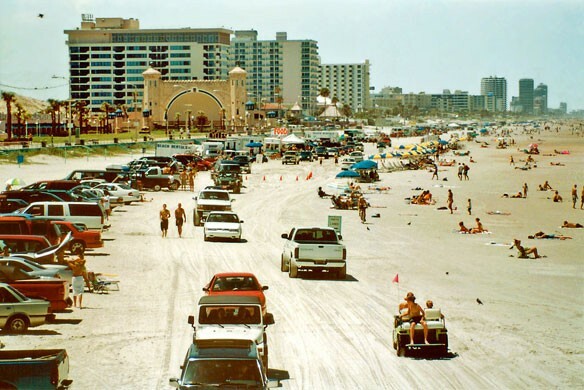 Volusia County in Florida is home of Daytona Beach and New Smyrna Beach, where there is a tradition of beach driving dating back to the early days of the automobile.